According to recent media accounts, an influx of the disruptive and hated-by-brides seaweed known as sargassum has washed up around the Caribbean for summer 2018. I had lived through it in 2015 on a trip to Mexico’s east coast, and felt embedded with the troops fighting the onslaught of seaweed. Said to have returned with force in January of this year, the unusual volume of sargassum, the brown strands of algae that originate in the Atlantic’s Sargasso Sea, has been an economic nightmare for some islands. This year, sargassum seems to be focused on reaching the East and South coasts of many islands, with potential to spread to more of the Caribbean, Yucatan peninsula and Florida. In Antigua, for example, one of the Elite Islands Resort properties, the St. James’s Club, is closing from July 15-September 30, 2018, during which time the company will invest US$3 million in renovations. “Our message is that we will use the closure to turns lemons into lemonade and turn seaweed into super suites by reinvesting in the resort,” COO Larry Basham told Tavel Weekly. Since Elite Islands has three other resorts on Antigua that have not been impacted by the sargassum takeover, they are able to accommodate all bookings. Where will you find sargassum? As of July 2018, the sargassum outbreak is reported to be impacting parts of Antigua, Barbados, Tortola, Sint Maarten and St. Martin, Martinique, Guadeloupe, Tobago, Canouan in the Grenadines, Dominica and Puerto Rico. It’s critical that travelers contact their resorts directly to inquire about the current status of this naturally occuring — an unpreventable — event. Visitors may find their resort beach pristine, for example, while the island’s port is clogged rendering ferry systems unusable. Some fishing villages report being overrun with mounds of drying seawood up to 10 feet high on beaches, with tons more clogging the harbor and preventing them from moving fishing vessels out to sea. Hopefully, the sargassum bloom may be an economic boon for others. On Barbados, research is underway to develop tools to convert it into fertilizer. In the most popular beach resorts, hundreds have found work shoveling the seaweed away from gold sand beaches so that brides can have barefoot weddings and other resort guests can swim and sunbathe. What is Sargassum and why is it bad? 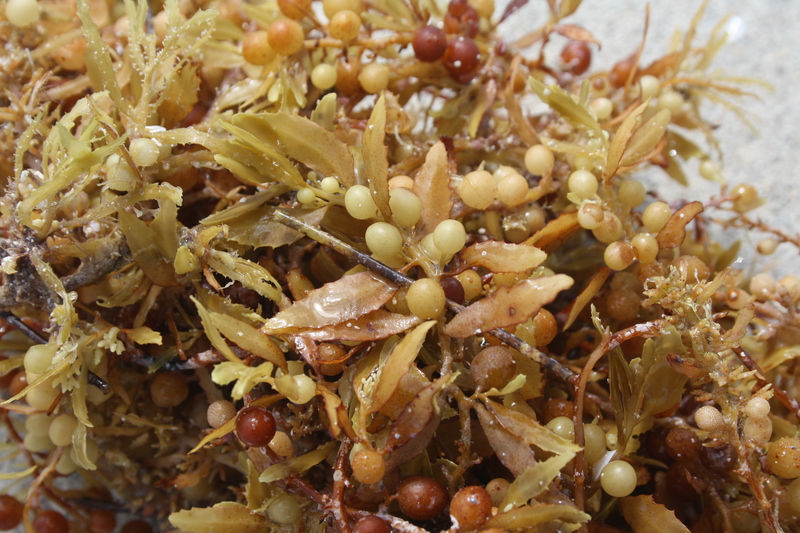 Sargassum is not new, but for centuries it was primarily in the 2,000,000-square-mile region of the North Atlantic known as the Sargasso Sea. Clumps of the rich and nourishing brown seawood would break off and drift across other areas of the ocean, but rarely in such volume. Left to dry on coastlines, in the hot sun, it becomes a tourism nightmare. Despite the eyesore and odor given off by the thousands of tiny plants and marinelife that travel with sargassum, it is not harmful in any way. Instead, scientists stress this eco-system’s importance to healthy oceans. Some speculate that climate change causing shifting water currents, warmer seas and more carbon dioxide is to be blamed for the abundance of sargassum, which otherwise occurs naturally. Here’s a look at what I experienced in Riviera Maya in 2015, and what is recurring now as it moves between regions of the Caribbean through at least September, and probably through the end of the year. Note that manual labor is used to remove the seaweed from beach areas where sea turtles may have made their nests, making cleanup efforts very costly. 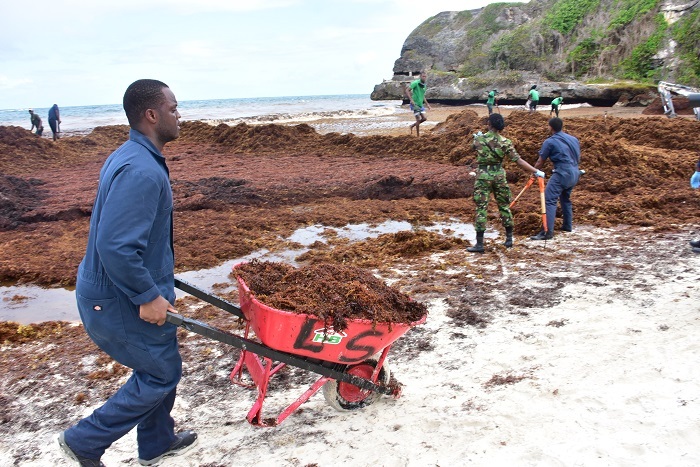 Conservationists say that large scale efforts to bury the seaweed in trenches dug into the sand will pay off in the future, when the sargassum attracts more sand to replenish and widen the beachfront along the most heavily developed coastlines. A Family Resource to make your own lemonade! If your resort is suddenly awash in sargassum, use the inconvenience as a learning opportunity for the whole family to understand firsthand why we must live in harmony with nature. The Caribbean Alliance for Sustainable Tourism’s handbook “Sargassum, A Resource Guide for the Caribbean” will fascinate school-age kids and is good resource for crafts projects incorporating the dried seaweed. All we know for sure is that trying it fight it on such a large scale is a losing proposition.